By land or by sea, Manhasset Bay Marina is the place to be. The largest full service Marina in the area with a restaurant on premises. 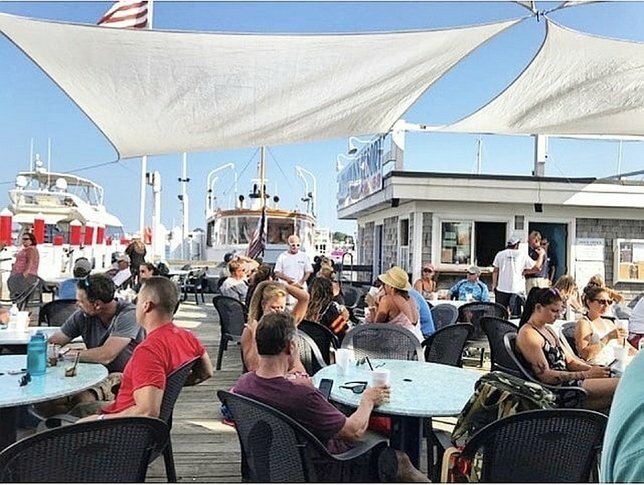 LaMotta's is the perfect waterfront dining experience serving lunch and dinner with beautiful views of the sound. Manhassset Bay Marina is family owned and operated for more than 30 years, serving boats up to 100 feet in length and featuring a full 80 ton travel lift. The marina is one of the most pristine in the area. The West Bank Marina was recently built from the ground up. A new bulkhead and docks are just the beginning of what makes The West Bank a great place to bring your boat, as a white sand beach, rainforest waterfall and landscaping, and imported palm trees give the marina a real tropical resort atmosphere. After you dock, head to the Tiki Bar Clubhouse for delicious food and tropical beverages,the perfect way to start or end a day on the water. On the beautiful North Fork, Long Islanders can head to the Lighthouse Marina right off the Peconic Bay in Aquebogue. The marina’s capacity can hold up to 70 boats and offers boating access all through the East End from Shelter Island to Shinnecock and Montauk. The marina is surrounded by other local attractions like the Atlantis Aquarium or vineyards and farm stands. The marina also offers dockside dining, picnic areas and a heated pool, but a membership is required to take a dip. Treasure Cove is nestled between the Long Island Aquarium and Hyatt Place, ideal location for a LI summer getaway. The marina features numerous amenities like indoor and outdoor pools, a fitness center, arcade for kids, ice cream shop, barbecue areas and the Seaside Grill for dining. The restaurant serves up casual bites like crispy clam strips, fresh watermelon salad, flatbreads and seaside fish tacos, the perfect bites while enjoying the tranquil views of the beautiful Peconic Bay. Star Island is the perfect destination for those who enjoy some good ol’ fishing. The marina hosts fishing tournaments from many of their charter boats. This marina also sells marine supplies, cleaning materials and guests can even enjoy a meal at the Star Deck Grill Restaurant, which serves fresh caught fish of the day. Situated on the banks of Manhasset Bay, in Port Washington, Capri Marina sits where the East River meets the sound. With almost 330 seasonal slips and space available for yachts up to 150 feet, the marina is a boater’s dream. Offering top notch service, let’s just say, Capri Marina strives to maintain a sophisticated resort style feel with a swimming pool, waterfront restaurant, golf cart service and a weekend courtesy car. Member’s can enjoy even more special amenities. Located on the North Shore of the island, the West Shore Marina in Huntington Harbor has slips for boats that range from 20 to 120 feet. The marina also has a beautiful swimming pool and picnic area that is perfect for relaxing and enjoying delicious fare from any of the local restaurants nearby like Prime, Finnegan’s, Bistro Cassis and many more. Subject: LongIsland.com - Your Name sent you Article details of "Check Out These Long Island Marinas"